Dyna Mechtronics DM-3220 CNC Vertical Machining Center s/n 8571 w/ Siemens/Dyna Mechtronics Controls, 24-Station ATC, 40-Taper Spindle, Hand Wheel, 19 ¾” x 39 ½” Table, Coolant. Matsuura MC-660VS CNC Vertical Machining Center s/n 871006309 w/ Yasnac MX3 Controls, 30-Station ATC, 40-Taper Spindle, Renishaw Wear System and M17 Machine Interface, 15” x 34” Table, Coolant. Kitamura MyCenter-1/485 CNC Vertical Drilling Center s/n 01933 w/ Kitamura/Fanuc 0M Controls, 16-Station ATC, 30-Taper Spindle, 10,000 RPM, Travels X=19”, Y=13”, Z=16”, 14” x 31” Table, Coolant. Matsuura MC-500V2 CNC Vertical Machining Center s/n 84064203 w/ Yasnac M5X Controls, 20-Station ATC, BT-35 Taper Spindle, 15” x 34” Table, Coolant. Logan FTV-2S 3-Axis CNC Vertical Mill w/Anilam Crusader Series M Controls, 40-Taper Spindle, Power Draw Bar, 10” x 50” Table,Coolant. Supermax YCY-16VS 3-Axis CNC Vertical Mill s/n 9022557 w/ Anilam Crusader Series M Controls, 60-4200 Dial Change RPM, 30-Taper Spindle, Kurt Power Draw Bar, Box Ways 9” x 49” Table. Nakamura-Tome Methods Slant 3X Twin Turret CNC Turning Center s/n C31709 w/ Fanuc System 11TT Controls, 12-Station Upper Turret, 6-Station Lower Turret, 16” 3-Jaw Power Chuck, Coolant. Nakamura-Tome Methods Slant 3B CNC Turning Center s/n C32308 w/ Fanuc System 10 Controls, 12-Station Turret, 12” 3-Jaw Power Chuck, Chip Conveyor, Coolant. Nakamura-Tome Methods Slant 3B CNC Turning Center s/n C31802 w/ Fanuc System 11TE Controls, 12-Station Turret, Hydraulic Tailstock, 10” 3-Jaw Power Chuck, Coolant. 10” 3-Jaw Power Chuck, Coolant. Nakamura-Tome Methods Slant 1H CNC Turning Center s/n C20705 w/ Fanuc System 6T Controls, 12-Station Turret, Hydraulic Tailstock, 6 ½” 3-Jaw Power Chuck, Coolant. Nakamura-Tome Methods Slant 1 CNC Turning Center s/n C20405 w/ Fanuc System 6T Controls, 12-Station Turret, Hydraulic Tailstock, 6 ½” 3-Jaw Power Chuck, Coolant. National Machinery ½” Cold Nut Former / Cold Header Machine s/n 37606 w/ 4-Stations,Straightener/Feeder, Shear. (2) National Machinery 5/16” Cold Nut Former / Cold Header Machines w/ 4-Stations, Shear. Facing Head Attachment, 54” Chuck. Hardinge HLV-H Wide-Bed Tool Room Lathe s/n HLV-H- 5274K w/ 125-3000 RPM, Inch Threading, Change Gears, Tailstock, Steady Rest, Power Feeds, 5C Collet Closer, Coolant. Feeler Second OP Lathe s/n 690864 w/ 230-3500 RPM, 6-Station Turret, 5C Collet Closer, Coolant. Hardinge DV-59 Lathe (NEEDS WORK). New Britain mdl. 52 6-Spindle Automatic Screw Machine s/n 39361 w/ Drill Stations, 50Cross Slides, Chip Conveyor, Bar Feed. (6) Davenport mdl. B 5-Spindle Automatic Screw Machines w/ Drill Stations, 5-Cross Slides, Threading Attachment, Pickup Attachment, Double Acting Chip Conveyor, Bar Feeds. Tree 2UVR Vertical Mill w/ 60-3300 RPM, Colleted Spindle, 10 ½” x 42” Table. Steinel SH4 Horizontal Mill s/n 1299A w/ 63-1250 RPM, 30-Taper Spindle, Power Feeds, Arbor Support and Arbor, 8” x 29” Table, Coolant. NEC DSX-80 Phone System w/ Phones. CopyStar CS-2550 Office Copy/Print/Scan/FAX Machine. CopyStar CS181 Office Copy/Print/Scan/FAX Machine. Hewlett Packard Officejet 6000 Wireless Color Printer. Brother IntelliFAX 2820 FAX Machine. Genspark mdl. CY20 Die-Sinker EDM Machine s/n 508424 w/ Genspark America 50P Power Source and Control Package, Heidenhain Programmable DRO, 11 ¾” x 23 ½” Table. Tishkin 8-Roll Roll Former (NEEDS CONTROL WORK). Urbis Thread Rolling Machine w/ Feeder. Cincinnati Milacron mdl. 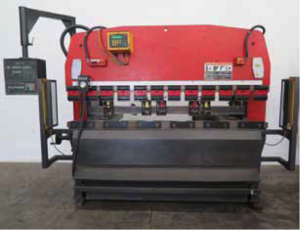 2MT Tool and Cutter Grinder s/n 7703Ao1-90- 0144 w/ Compound Grinding Head, Grinding Fixture, 6” x 36” Table. Cincinnati Tool and Cutter Grinder s/n 31512T5U-0264 w/ Compound Grinding Head, Grinding Fixture, 6” x 36” Table. Cincinnati Tool and Cutter Grinder s/n D2T2T-67 w/ Compound Grinding Head, Centers. DoAll D-8 8” x 24” Automatic Hydraulic Surface Grinder s/n 101-62196 w/ DoAll Fine-Line Electromagnetic Chuck. Reid mdl. 1604 6” x 18” Automatic Surface Grinder s/n 20474 w/ Ceramax Magnetic Chuck, Wheel Dresser. Boyar Schultz “Six-Twelve” 6” x 12” Surface Grinder s/n 14743 w/ Magna-Lock 6” x 12” Fine-Line Electromagnetic Chuck. Import FSG-618 6” x 18” Surface Grinder (NO MAGNETIC CHUCK). Miller Millermatic 250X Welding Power Source s/n LA273464 w/ Spool Gun Board Installed. Taylor Winfield Ther-Monic mdl. CE-1000 10kW Induction Heating Unit s/n 960263-A. Taylor Winfield Ther-Monic mdl. MKII-5 5kW Induction Heating Unit s/n 960204 w/ 6-Station Rotary assy. Sweco FMD-4LR 39” Media Tumbler s/n PMD478737C. Automated In-Line Wash System w/ Gripper Loader, Heaters, Pumps, Air-Blow, Exhaust Fan. DoAll 15 ½” Vertical Band Saw w/ 50-5200 FPM, 24” x 24” Table. Kalamazoo mdl. 8-C- W 20” Automatic Abrasive Cutoff Saw (NEEDS WORK). New Holland mdl. 440V-K2- ELEC Spin Dryer. Crane “Lapmaster 12” 12” Lapping Machine. Compressor s/n 1211 w/ 2-Stage Pump, 120 Gallon Tank. Pacific 20Hp Horizontal Air Compressor w/ 200 Gallon Tank. Campbell Hausfeld CI103120HB 10Hp Horizontal Air Compressor w/ 120 Gallon Tank. (2) Zagor Automatic Pneumatic Power Drills. (2) Marley “Aquatower” Cooling Towers Donaldson Torit mdl. DWS-6 6-Element Dust Collector s/n 4353297-1 w/ 7.5Hp Motor. UFM “Uni-Hone” Dry Blast Cabinet w/ Dust Collector. Bench Model Dry Blast Cabinet. Ingersoll Rand mdl. PD30A-AAP- GGG-C Pneumatic Pump. Magna-Tech mdl. 3505-6 28” x 48” Magnetizer /Demagnetizer s/n 833003. Beltmaster 4” Belt Sander / Buffer.